First off, I think I might owe you a little apology. See, I’m not exactly sure whether you’re the right people to be sending this letter to. I think it’s probably you, but maybe I should be sending this to the Department of Parks and Recreation. Or maybe this should be going to the Department of Transportation. That could make sense, unless I should be sending it to the Department of Motor Vehicles. On the other hand, maybe the State Parks people should be the ones reading this. Or, possibly, the Department of Roadway Design. Kinda hard to say, honestly. Maybe after you read this letter you’ll do me the favor of sending this on to the people who should be reading it. If it’s not you, I mean. Which it might be. Possibly. Last weekend, The Hammer and I (joined by the IT Guy for the second half of the ride) went on a big ol’ training ride: The Gauntlet Supreme. Starting from home, we ride up American Fork Canyon to Granite Flat, up to the summit of the Alpine Loop, down to Cascade Springs, back up to the summit of the Alpine Loop, down to Provo Canyon, up and down Squaw Peak, up Provo Canyon, up and down South Fork, and then up the Sundance side of the Alpine loop and down the AF side, and — finally! — back to home. It kinda looks like a man holding a bell, doesn’t it? At least a little bit? That’s a pretty jagged-looking elevation chart. Which is fine. We signed up for all that climbing, so we aren’t going to complain about it. No, just kidding. Actually almost the whole rest of this letter is going to be complaining. So you might want to brace yourself for that. See, there’s one particular part of this ride that just seems . . . well, wrong: The Cascade Spring climb. No, the problem isn’t with the scenery; the scenery is gorgeous. The problem isn’t with traffic; since this seven-mile road goes nowhere but to a small (but beautiful and well-worth seeing in its own right) park, there’s rarely any traffic at all. The problem isn’t even with the pavement; there are some cracks with weeds growing through, but they aren’t really a problem. The problem is with the elevation profile. Well, that’s because you don’t ride a bike, US Forest Service (or whoever). Which is understandable, I guess, because it would be weird to see the US Forest Service on a bike. And probably very uncomfortable for you. I’m getting sidetracked. Let me get back to my point. 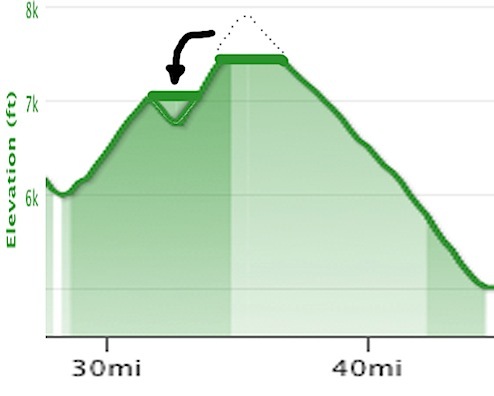 The problem with the Cascade Springs Climb is that it has a nice one-mile descent, right in the middle of the climb. The result being that you climb three miles, descend one mile, and then climb three more miles to get to the summit. And that just goes to show, US Forest Service, that you don’t understand what is going on in the mind of cyclists when we are doing a big climb. Allow me to clear that up, for your future reference. And we do it. We bribe ourselves, lie to ourselves, convince ourselves, argue with ourselves, and otherwise hold internal dialogues that would frighten priests and psychiatrists alike. Whatever it takes to keep the legs turning until we get to the top. But just suppose that right in the middle of this dramatic and traumatic and superhuman effort, the climb ends? And instead of climbing and suffering and gnashing our teeth, we are coasting effortlessly downhill? The storm of emotions is just too much to take. But then there’s distress: “This descent ends in just one mile. At 30mph, that’s just two minutes before I have to climb again. I don’t want to start climbing again in two minutes. I don’t want to start climbing again at all. It is at this moment that the weeping usually begins. For while cyclists are — for some reason — OK with earning a big chunk of altitude all at once, it is with the expectation that we will get to spend it all at once, as well. Here, instead, we descend just long enough for our legs to fall out of the rhythm of climbing. To let the lactic acid pool up. To realize, fully and completely, that we’re tired. And then we have to start climbing again. Climbing up to a height we already climbed up, just a couple minutes ago. Whimpering and complaining is not only common, it’s expected. US Forest Service (…), I am not the kind of person who identifies a problem without suggesting solutions. I have two excellent ideas, either of which I believe can be executed with a minimum of expense and effort. I think the benefits of doing this are as obvious as they are compelling. First, cyclists (i.e., me) still get a nice little break from the climbing — when you’ve been climbing hard, flat really does feel like downhill. Second, finishing times for this climb would shrink drastically, causing cyclists to feel much better about themselves and their state of fitness without having to resort to ridiculous measures like doping or training more. Further, I believe that if you build this bridge you’ll bring curious people from all over the world to see this two-mile wonder. Certainly, the surge of tourist dollars will more than offset the minor costs you might incur by building this bridge. One last note regarding this bridge: I think you should make it out of carbon fiber. It’s both strong and light. Idea 2: Redistribution: While I believe my first idea is a good one, I must be honest with myself and admit that it is really nothing more than a half-measure. To really and truly fix the problem, you’re going to need a big shovel. Where the “bridge” idea simply eliminates redundant climbing on this road, filling in the unneccessary descent and subsequent climb with what was previously the top of the mountain actually reduces the total amount of climbing required. Consider: Right now cyclists must make a thousand-foot climb, descend 300 feet, and then make a 1200 foot climb. 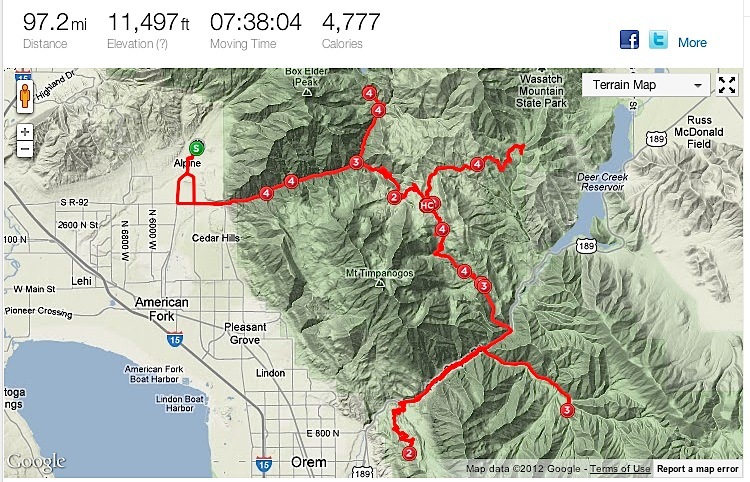 That’s 2200 feet of climbing. With my “Repurpose the Mountain Summit” plan, however, we’ll climb up a thousand feet or so, catch our breath on the two-mile flat section, and then make a 500 foot climbing push to the new, lower, and flatter summit. That’s 1500 feet of climbing — a savings of 700 feet. Honestly, I don’t even think I need to explain how perfect an idea this is. In fact, I am currently agog at my own brilliance. US Forest etc., I believe I have presented a compelling case; I can see no reason why you would not begin work on this immediately, even at the expense of in-progress projects. This is that important. I look forward to climbing the new and (drastically) improved Cascade Spring climb. I’m sure they’ll get right on that for you. And holycrap you guys know how to do a MONSTER ride! My legs are weak sitting in my comfy office chair just thinking about it! Yes, it’s not an optimal path. It makes me think,, you’d hate golf. Dirt: laterally stiff, vertically compliant. Don’t ever move out east. 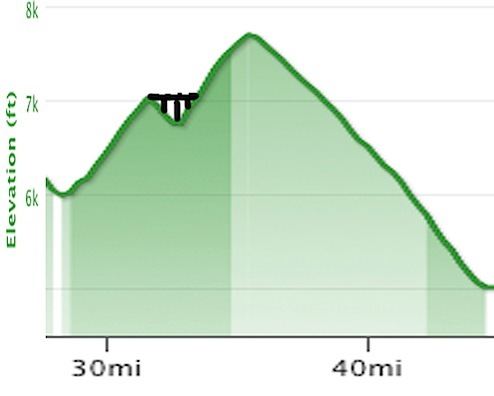 That is the profile of almost every climb. I always tell people the descents in the mountains and foothills of Pennsylvania and West Virginia mountains are even hard because they always involve a 15+% grade climb. C’mon, ya big wuss! Just build a little speed to use that first, false summit as a ramp and huck it over the gap! 1. You land a the same elevation you started. No wasted climbing. 2. You get to see a beautiful valley below your flying bicycle. Think ET on a road bike! 3. You spare the fine taxpayers of this nation the expense of the over-priced Fat Cyclist solutions. 4. You break many of Evel Kneivel’s best records and put his Snake River Canyon debacle to shame! “I think you should make it out of carbon fiber. It’s both strong and light.” This line actually made me laugh out loud. I feel a little embarrassed about my upcoming ride this weekend. I better cowboy up. Fatty… first off… your Gauntlet Deluxe ride looks awesome in a painful sort of way. Having just recently finished the Colorado Triple Bypass, I know now what local training route I should take to replicate that ride. Secondly and more importantly… this really cracked me up. Thanks for the laugh. Having ridden that climb myself, I know your point exactly and agree on the carbon fiber construction. Maybe ENVE will take that on? They can make it out of wheels. I hope the pro riders don’t see your post. Can you imagine the Col de Tourmalet or the Col d’Aubisque, or Alp d’Huez…..please don’t send your letter!!! I would like to suggest that if in ‘topping’ the mountain they discover coal or valuable minerals, they are welcome to continue the task and ‘level’ the whole thing. 4.8 would then be a thing of the past, and us ‘true’ fatties could come out and ride. I hate the Cascade Springs climb so much! You really are a glass-half-empty guy, aren’t you? I despise the Cascade Springs climb. Great write up tho. Made me laugh. Thanks as always. Here in Kentucky, all you have to do is suggest that there is coal under the top of that mountain, and you would have people lining up perform option 2 for free… Be careful what you wish for. what does agog mean anyway?? I look forward to seeing this post in book form one day. Maybe my comment will make it too… One can dream. Whatever they do I hope it’s not idea number 2. By taking the top of the mountain to fill in the “gap” you lose the start of what looks like a great downhill on the other side, right in the middle of the ride where you need it. Lol on the bridge “graphic”. Why stop at just the mountain top. You could flatten out the entire state. You would move the top of the Alpine Summit climb?!?! Sacrilege!!! Hey, I *AM* a priest! I would say a rosary for the opportunity to hear what you think would frighten me. :-) Especially after the interior monologue I used on Monday’s ride, after I fell off the bike club train and was left all alone on my brand new super fancy super light bike with the super duper light wheels, in the middle of MAJOR WIND. Your exterior monologue might be far less scary than my interior one. A carbon fiber bridge would look really cool. However, braking performance in both wet and dry conditions could be a problem. Fortunately, not many cyclists seem to care about carbon fiber’s sub-par braking performance as long as it looks cool. As a former Forest Service employee I loved your post. A summit redistribution project just might work. The Environmental Impact Report would take a while though so hope you are not in a hurry. Fatty I do believe you Stravasniped the Hammer on the climb. Your 4.8 mph speed got me thinking….when I rode the Blue Ridge Parkway this summer (a serious shock to the system when you are from Florida) that was my slowest speed on one of the climbs. In fact that is the slowest I have ever gone on a climb. Ever. (Not surprising if you have ever visited Florida). So – what is the slowest one can climb and not fall over? Does anyone ever refuse to accept that they have to clip out and walk and then suddenly find themselves laying sideways on their bike on the road, still clipped in? And if they did, would they ever admit to it? Love the bridge idea. I will propose that in my next corporate meeting. But when that happens I assume other flat and smooth places shall be exalted, with even more epic mountains and valleys for us bikers. Great post and great ideas Fatty! Hahaha!! Got a great laugh out of this post! Fatty: Your drawing of the bridge made my day! And as usual, great comments from all the Fatty fans! TallSteve: OMG – you run a mtn. biking club?! Then you can TOTALLY make this happen for Fatty! And thank you for being sensitive to the endangered burrowing Spotted Toads! Toads are people too! Alison: Yes, I’ll admit it. I was ‘attempting’ to climb a steep hill in San Francisco, refusing to accept that my slow speed would require me to unclip and walk it instead. I found myself laying sideways on my bike on the road, still clipped in. It was pathetically embarrassing to me, but probably hysterically funny for anyone who might have seen it! Great post, awesome idea ! In a nutshell : as we don’t have ANY mountains in the Netherlands we build one ourselves. 2 km high , multipurpose. I need to change my name, why do I get all these crap letters. To my understanding from reviewing some of your earlier waist management bicycle rides I have passed this letter onto our Waste Management Department. They will look(figuratively speaking as management ‘never’ actually ‘looks’ into these situations, they wait for the reports from Kanyon Kris) into placement of port-a-potty at the end of that 1 mile (muscles relaxing) descent, you know just before you do some more grinding and weaving to the top. The WMD will be in contact with you (whenever) as to the precise placement of this dumpsite. OH Yes ! Be sure to bring the proper number of quarters. AND new restrictions on the seatcovers(one size fits all) do not allow them to be used as sombreros. I believe you are thinking way to small. If we start with a high point somewhere in Kansas or Missourri, we just grade the entire country into a nice shallow .01% slope towards both coasts. This will greatly simplify cycling, while still allowing for proper drainage. While the U.S. Forest Service runs the largest network of roads in the country (read Bill Bryson’s hilarious “A Walk in the Woods” for the full information — it’s just one chapter but read the whole book) I am afraid you must address your letter to good ol’ Mother Nature. While the Forest Service could construct a bridge, it’s mean ol’ Nature that created that profile in the first place. It seems the engineering standards of 4.5 billions years ago (though your mountains are probably younger, only 30 or 40 million years) did not allow for long, smooth climbs without interruptions. @Bart I too would love to get Fatty’s take on the 2km hill. Can someone teach him Dutch? Oh, never mine the details, he can have an informed opinion regardless. 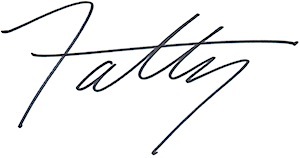 Fatty – my company will get right on the RtMS Plan. Allison – According to my Avatar, Clydesteve, 2.5 mph is around the tipping point. And, yes, this has happened to me. I lay heaving in exhaustion in the gravel alongside the road at top of my daily 1/2 mile long 20% hill as my neighbor gazed concernedly and curiously and embarrassedly at me out of his pick-up window, wondering just what he should do that could be neighborly and still allow me to save face. There was nothing. 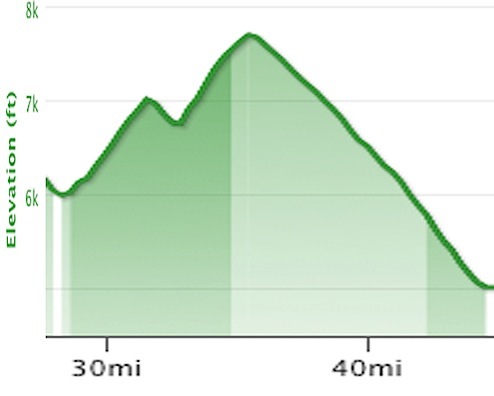 The profile of that ride proves one thing for sure… I’m a wimp. Solution 3 would be to make the bridge slope from the first peak to part of the way up the second , thus allowing you to maintain the climbing motion pace ! Were you as surprised at the Olympic Road Race result , thought the ” UCI ” would go ballistic ? Looking forward to your report ! I think I lost 2 pounds looking at that chart!! !